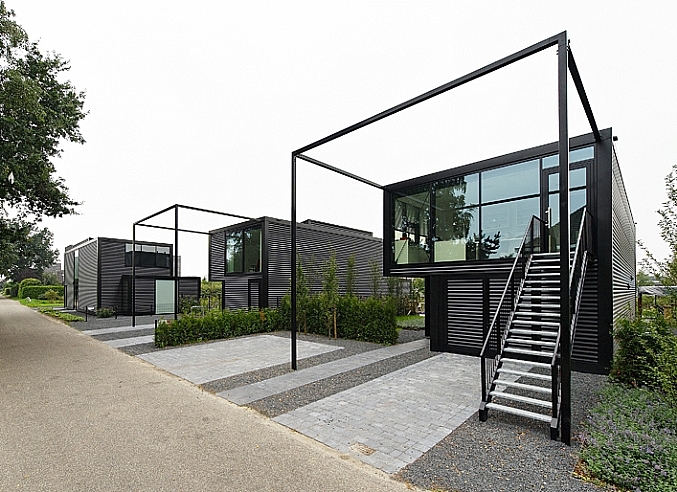 Houses in Apeldoorn, the Netherlands (Courage Architects). The main feature of a flexible design is that it is adaptable. Flexible design distinguishes between the load-bearing structure (structural framework and floors), the facades and installations. A flexible structural framework is a skeletal structure. A structure with (continuous) load-bearing walls is not (or barely) adaptable, especially if the walls play a role in the stability of the building. A skeletal structure facilitates the relocation of interior walls, the replacement of cables and pipes, the renewal of facade elements, and even the later merging of floors or the installation of lifts or stairwells. A skeletal steel structure has large floor spans and large net floor heights with relatively light and small-scale structural elements (columns and beams). The complete or partial integration of the beams in the floor construction (integrated beams) results in a lower gross floor height. The benefit of this is not only a larger net storey height, but also a small building volume which is likely minimise the energy required for heating and cooling. A skeletal load-bearing structure (right) is flexible. Office building height NOT less than 10 m.
Reallocation to housing is not feasible if the office building does not meet these requirements. There are also some less firm requirements for the load-bearing structure. Load-bearing structure is sufficiently far from neighbouring buildings to make horizontal extensions possible (see also: Flexible design, facades). When designing for a (potential) change in building function, the designer must pay particular attention to potential changes in variable loads on the structure. The change from office to home is often relatively easy, because the variable loads in a house are usually limited. But from office to shop is usually not so simple. The variable loads for each function class are fixed in NEN EN 1991-1-1. Variable loads for each function, according to NEN-EN 1991-1-1.